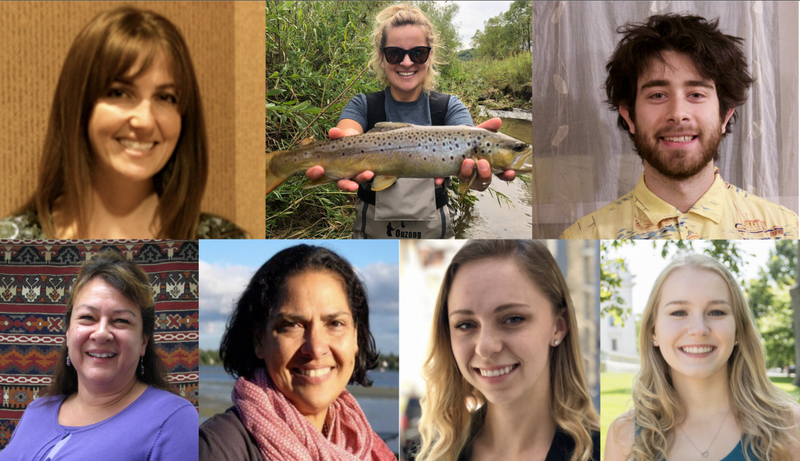 This fall semester, the Global Health Institute (GHI) has welcomed seven new team members who are committed to ensuring health for all and helping spread the institute’s mission. They are contributing to research, education, outreach, communications, event planning and other activities needed to promote global health. Meet our new team members below. After receiving her Ph.D. from UW-Madison’s Nelson Institute for Environmental Studies, Stull is excited to join the GHI team and dive into research related to food security, food sovereignty and environmental health. She will be working with GHI Director Jonathan Patz and GHI Advisory Committee member Susan Paskewitz to investigate sustainable food systems and human health. Stull will be spearheading the Mission to Improve Global Health Through Insects (MIGHTi) Project. MIGHTi is a collaborative research project that evaluates the social, environmental and health implications of insect agriculture. Stull’s work recently garnered media attention from news outlets around the country. She was the lead author of a pilot clinical trial that looked the positive health benefits of eating crickets. When Lundberg started to think about the connection between global health and her research, it just clicked. Lundberg will be working with GHI Associate Director Tony Goldberg and Professor Caroline Gottschalk Druschke on a project looking into challenges to “stream health,” how these concerns are prioritized and what a “healthy stream” is. Lundberg is also the graduate student researcher on the Kickapoo Buffer Project and is working on her dissertation research on brook trout management in Wisconsin. When Lundberg isn’t working on her research or coursework, she tries to spend as much time as possible outdoors exploring, running or hiking. Fremont, a graduate from Macalester College in St. Paul, Minnesota, will be working with GHI’s Samuel Younkin on the HOT initiative. HOT aims to improve community health by making active transportation, such as walking and biking, more accessible for individuals. With his background in applied mathematics and statistics, Fremont will be analyzing HOT’s project data and programming. He spent two years working in the software industry after finishing his undergraduate education and is now excited to be working on research. “I am interested in the field of biostatistics and its applications in environmental science, so having the opportunity to contribute to such a project as HOT is very exciting for me,” Fremont says. Outside of work, Fremont enjoys playing ultimate frisbee. Before joining GHI, Peterson worked in the director’s office at University Health Services and the Office of the Vice Provost and Chief Diversity Officer. Peterson has a background in health education and worked as a health educator for 13 years. She’s looking forward to bringing her health education experience and applying it to her role at the Institute. Peterson will be working with Patz, assisting with alumni and donor outreach, helping coordinate GHI events and general office management. Outside of work, Peterson enjoys cooking, volunteering in the community and finding ways to be outdoors. Moreno works with the Undergraduate Certificate in Global Health program and collaborates closely with GHI Associate Director Lori DiPrete Brown to develop curriculum. Moreno is also a multicultural outreach specialist with the Earth Partnership Program, a restoration education program that does community outreach, professional development and working with youth. At Earth Partnership, she develops curricular materials and outreach programs centered on ecological restoration. She also designs, teaches and supervises service learning as well as domestic and international internships on environmental education. Moreno is excited to be working in a place where people are energized and passionate about the projects they are working on. Moreno is currently working on organizing the annual High School Global Health Day and collaborating with field course leaders to learn more about their experience. Palmer is an undergraduate student at UW-Madison pursuing a degree in Life Sciences Communication and certificates in Global Health and Gender and Woman’s Studies. She runs GHI’s social media pages, including Twitter, Facebook and Instagram, and helps promote and plan the different events GHI hosts throughout the semester. Palmer hopes to use the internship to refine her communication and time management skills. She looks forward to sharing the institute’s mission and communicate global health concepts to the UW-Madison campus and community. “I’m excited to have the opportunity to work alongside some of the most inspiring global health innovators in Wisconsin and the world,” Palmer says. When Palmer is not at the GHI office, she’s usually studying for her classes, working as a Certified Nursing Assistant (CNA) or as a student hourly worker at the UW School of Nursing, volunteering or playing for the University Marching Band. Zaluska is an undergraduate student at UW-Madison pursuing a degree in Journalism with honors in the liberal arts and a certificate in Criminal Justice. She updates GHI’s website by updating it with relevant news posts, writes articles about global health projects and creates a weekly events newsletter. Zaluska wanted to join the GHI team after learning more about the institute’s mission, projects and events. She is most excited for the ability to continue one of her favorite activities — writing. In addition to working at GHI, Zaluska also works for The Badger Herald, managing their social media accounts. She also enjoys spending time at Memorial Union or going to the Saturday farmers market.